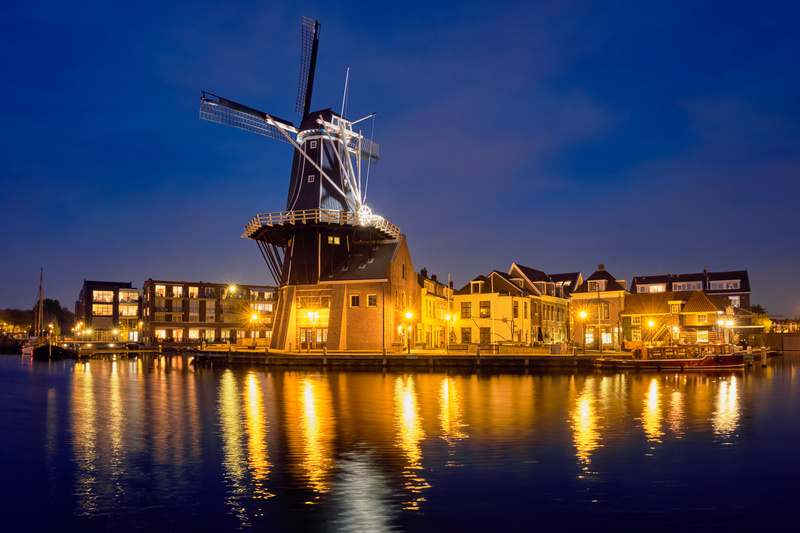 Discover the best things to do in The Netherlands and Holland in December. Do you want to visit the best Christmas markets in The Netherlands? 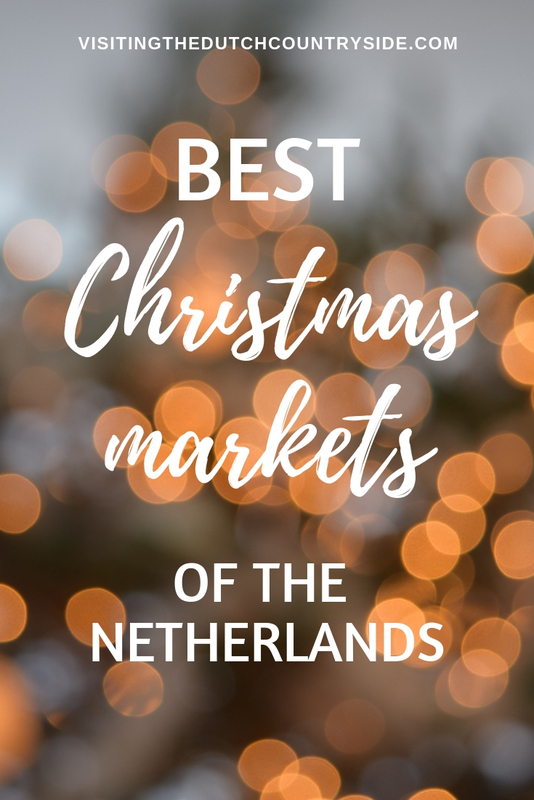 Here you will find all the information about the best Christmas markets in The Netherlands you should visit and travel to. 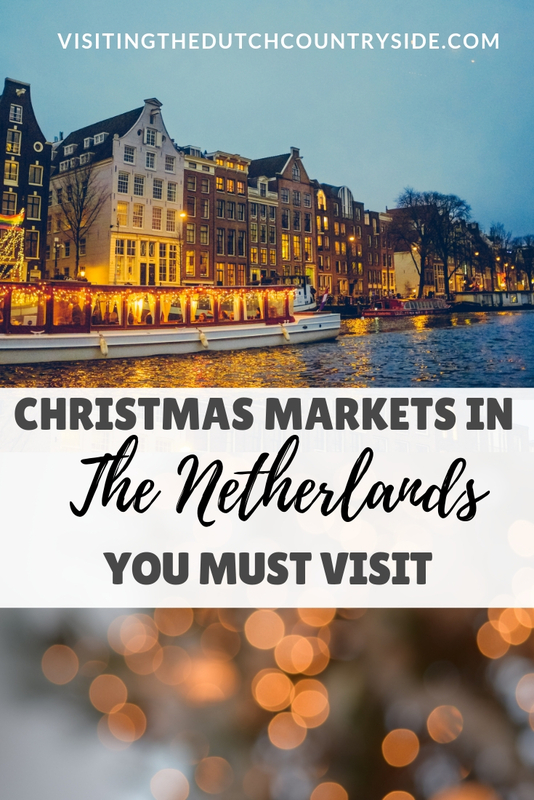 Visiting the best Christmas markets in The Netherlands should be on anyone’s things to do list in November and December in The Netherlands. Christmas markets in The Netherlands. It’s not something visitors tend to think of when they are visiting my country during the winter and Christmas holidays. However, there are beautiful Christmas markets that you have to visit when you are in The Netherlands during Christmas time in 2019. Here you will find the most beautiful Christmas markets in The Netherlands. 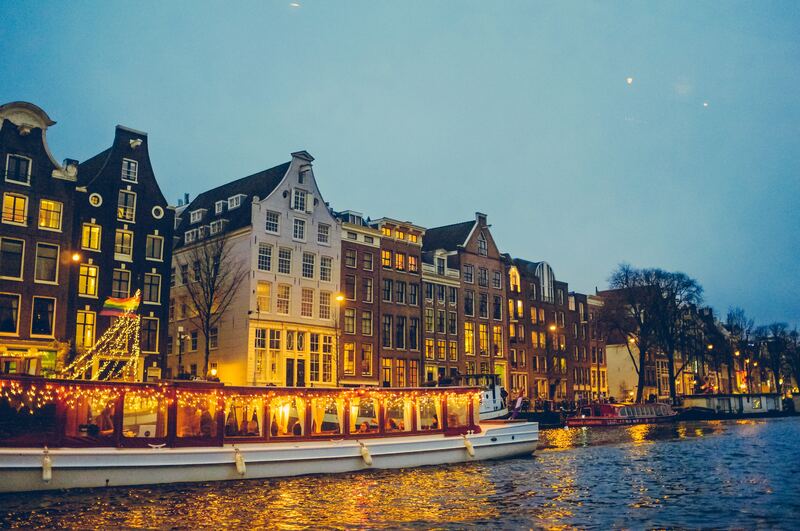 From the floating Christmas market to the biggest Christmas market of The Netherlands. 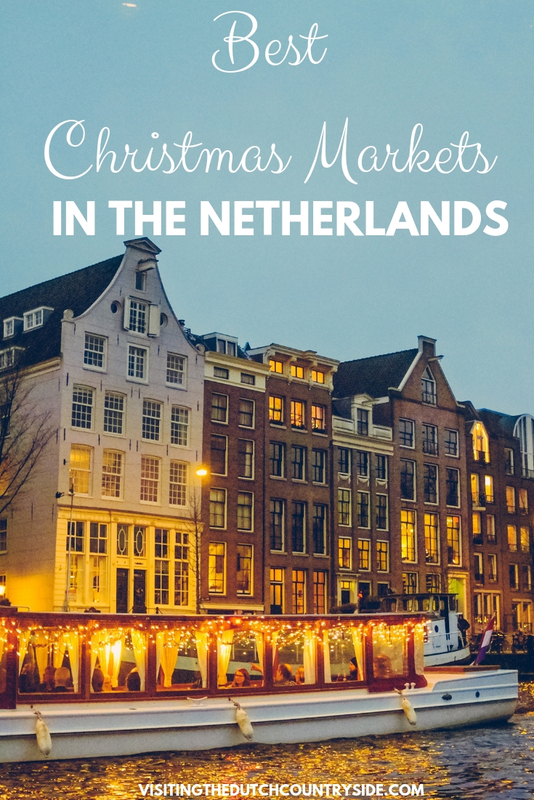 Including all the information on what to do, where to stay and how to get to the Christmas market in The Netherlands. Christmas time is one of my most favourite of the year. Everything turns very ‘gezellig’. ‘Gezellig’ is a Dutch word that sort of means cosy but is not the right translation, as the word doesn’t exist in English. Once you get to The Netherlands you will understand the meaning. During Christmas it gets very ‘gezellig’ and every, little café is filled with people. Their noses are red from the cold, rain, wind and snow. They enjoy a nice cup of tea or a hot chocolate with whipped cream. Hearing the endless chatter of people, the coughs of the transition from warm to cold when they enter the streets again is mesmerizing. Seeing the decorated streets and squares. Visiting the Christmas markets in The Netherlands. I love all of it. And I think you should too. Not all dates for the Christmas markets of 2019 in The Netherlands are known yet, as soon as they are known the dates will be placed and changed here. The Christmas market of Dordrecht is a true treat. I visited the biggest Christmas market in The Netherlands years back and remember that I was in awe of how big it was. Especially coming from a small village in Noord-Holland. We didn’t, and still, don’t have anything this big in my surrounding during Christmas. 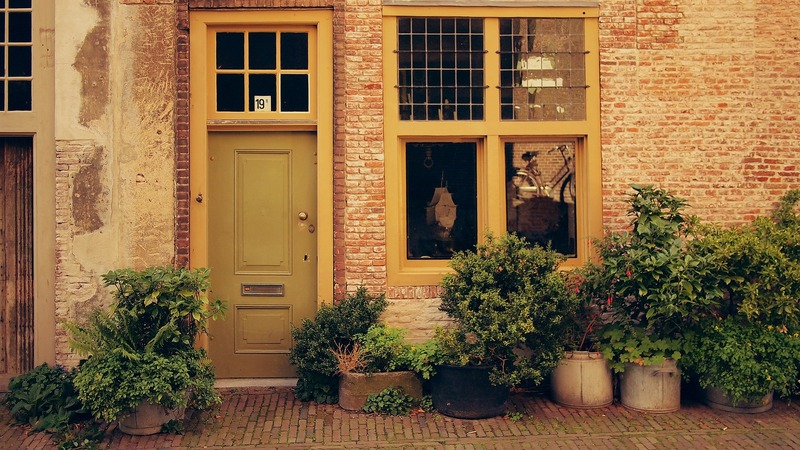 The city of Dordrecht is one of the most beautiful in The Netherlands with many monumental buildings. And in the middle on a big square, placed between those buildings, you will find the Christmas market of Dordrecht. Last year more than 375.000 people visited this Christmas market in The Netherlands in the span of just three (!) days. Every year there are more than 350 stalls on the market. So if there are a few places that you don’t like I’m sure that the remaining 300 stalls can offer something for you. Most stalls are around the Grote Kerk, Voorstraat, Visbrug and the square near the city hall. – There are many things to do in Dordrecht during the Christmas market. Walk the entire Christmas market. 350 stalls. And there is food. Do I have to say more? Eat your heart out and get yourself some hot chocolate and/or glühwein. – Listen to the musical winter terraces. Close to the city hall of Dordrecht, you will find these terraces where you can listen to the magical voices of gospel choirs. All while sipping on your chocolate milk of course. – Sing during the Christmas sing-a-long. At the end of the day, you will find, at the same location as the gospel choirs, a Christmas sing-a-long. Here you can sing along with all the Christmas songs ever made. – Visit the Christmas theatre in Grotekerkstuin. You will find cool acts and a ‘living’ crib with some sheep, goats, and shepherds. – Go ice-skating. For a real Dutch experience, you would at least need to get on the ice. Even if you fall. It’ll be fun. From Amsterdam: Take the intercity (yellow train) in the direction of Vlissingen and get out at Dordrecht train station. It will take you approximately 1,5 hours. From Rotterdam: You can take the sprinter (blue-white train) in the direction of Dordrecht, the intercity train (yellow train) in the direction of Vlissingen or the intercity (yellow train) to Dordrecht. This will take you anywhere between 15 and 24 minutes. From Utrecht: You would need to take the intercity in the direction of Rotterdam Centraal. From Rotterdam Centraal, you will take one of the trains I mentioned above. In total it will take you around 1 hour. From the train station, it is only a ten-minute walk. Don’t worry, there are plenty of signs that will guide you to the biggest Christmas market in The Netherlands. The Christmas market in Dordrecht takes place throughout the city. You will see things on the following squares and streets; Stadhuisplein, Grotekerkstuin, Blauwpoortsplein, Nieuwe Haven, Aardappelmarkt, Vismarkt, Grote Markt and Waagplein. The market is free to visit and has around six spots with free toilets. Besides that, if you are invalid you can still visit the market as they have taken this into account. The Christmas market of Dordrecht takes place on the 13th, 14th and 15th of December 2019. The first two days it is opened from 10:00- 21:00. The 15th the market is opened from 11:00 to 18:00. Tip: Have enough cash. There will be some stalls that accept pin, but, not everyone will do that. Also, credit cards are still not really accepted very often in The Netherlands because we, the locals, don’t use them. More information about credit card acceptance here. B&B Op Ut Hoekie, click here to see the availability. Driemaster Grietje, click here to see the availability. Heer & Meester Bed & Breakfast, click here to see the availability. For more information, I would suggest you visit the official website of the Dordrecht Christmas Market here. The Christmas market of Valkenburg is one of the most special Christmas markets of Europe. 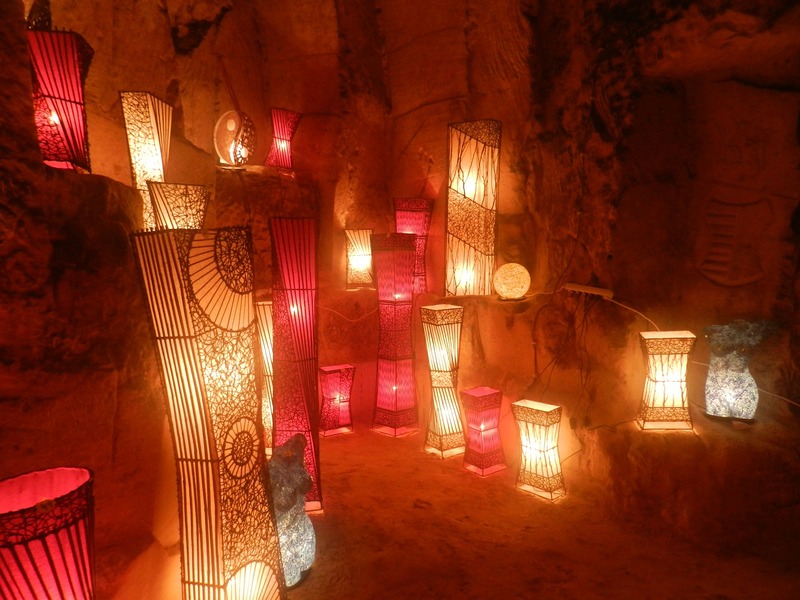 There are three Valkenburg Christmas markets that are all held in marl caves. The Gemeentegrot is the biggest and heart of the markets in Valkenburg. It is therefore also called the Valkenburg Cave Christmas market. Every year more than 110.000 people visit the Christmas markets of Valkenburg. And in my opinion, it is one of the best European weekend breaks during winter. Twice a week there is a beautiful Christmas parade in Valkenburg as well, which is definitely worth seeing. Although the assortiment of gifts isn’t that special in the caves, the whole atmosphere is worth a visit on its own. The first cave is the Gemeentegrot, which is the biggest cave and has wide corridors. During the Christmas market, the Gemeentegrot is beautifully decorated with lights and other decorations. There are candles lit everywhere, which makes the atmosphere even more beautiful. And of course, there are many stalls where you can do some wine tastings, have a chocolate fondue, buy candies and much more. This cave and Christmas market is basically the heart of the Christmas market of Valkenburg and the biggest of all three. There are several caves that you can enter. One of them is called De Fluweelengrot. Within this cave (grot in Dutch) there are stalls in the small inlets of the cave. Because the corridors within the cave are smaller than the other caves, it can and will be busier in this cave. So be on time. In this cave, there are paintings and sculptures that are placed against the wall. It is definitely a special sight to see. The last cave is called the Mergelrijkgrot. This cave has been opened since 2014. This is the cave you need to go to if you are interested in hearing more about the history of the caves while eating special Limburger delicatessen. – Visit all three of the caves. – Take a look at the Valkenburg Christmas market parade that is held twice a week. On Saturday at 19:30 and Wednesday at 19:00. Take the intercity train from Amsterdam central in the direction of Heerlen. Get out at Heerlen station and take the ‘sneltrein’ in the direction of Maastricht Randwyck. Get out at Station Valkenburg and walk 15 minutes or take the bus as I suggested before. Or you can take the intercity train to in the direction of Maastricht and get out at Maastricht station. From here take the ‘stoptrein’ in the direction of Heerlen and get out at Valkenburg station. It will take you three hours one way. Take the intercity train from Rotterdam Centraal in the direction of Eindhoven. Get out at Eindhoven and take the intercity train in the direction of Maastricht. Get off the train at Maastricht. From here you will take the ‘stoptrein’ in the direction of Heerlen and get out at Station Valkenburg. This will take you 2 hours and 50 minutes. Take the intercity train (yellow train) from Utrecht Centraal in the direction of Maastricht and get out at Maastricht station. Take the stop train in the direction of Heerlen and get out at Valkenburg station. From there it’s a 15-minute walk to the caves. Or take the intercity train from Utrecht Centraal in the direction of Heerlen, get out at Heerlen. From Heerlen take the ‘sneltrein’ in the direction of Maastricht Randwyck. Get out at Valkenburg station. It is a 15-minute walk to the caves as well. If you don’t want to walk or am not able to. There is a bus from Valkenburg station. Service bus 8 in the direction of Maastricht Boschpoort, get out at bus stop Grendelplein in Valkenburg. From here it is a one-minute walk to the caves. Keep in mind, this bus is a tiny bus and goes once an hour. It doesn’t go on Sundays. All of these options will take you around 2,5 hours one way. The price of the Christmas markets differs. The reason for this is that there are different caves and thus Christmas markets that you can visit in Valkenburg. You need to keep in mind that 7 euros entry per cave is usually asked, but when you visit more you can have a discount. Dates of the Valkenburg Christmas market 2019: opened from the 15th of November 2019 until the 5th of January 2020. B&B De Plenkert, click here to see the availability. Hotel Karsteboom, click here to see the availability. Hotel Valkenburg, click here to see the availability. In Leiden you will find a lot of activities from the end of November until the 6th of January, they call it the Winter Wonder Weeks. But the floating Christmas market of Leiden will be held from 14th -25th of December 2018. This Christmas market in The Netherlands is floating in the middle of the canals of beautiful Leiden. Visiting the Christmas market of Leiden is a great idea, as this market is the only floating Christmas market of The Netherlands. Every year more than 140.000 visitors. And there is a reason for that. From the floating Christmas market to a floating ice rink. And from choirs all throughout the city to street theatre in the style of Charles Dickens’ ‘A Christmas Carol’. Leiden is an incredible city to visit with plenty of things to do and amazing restaurants to eat at. 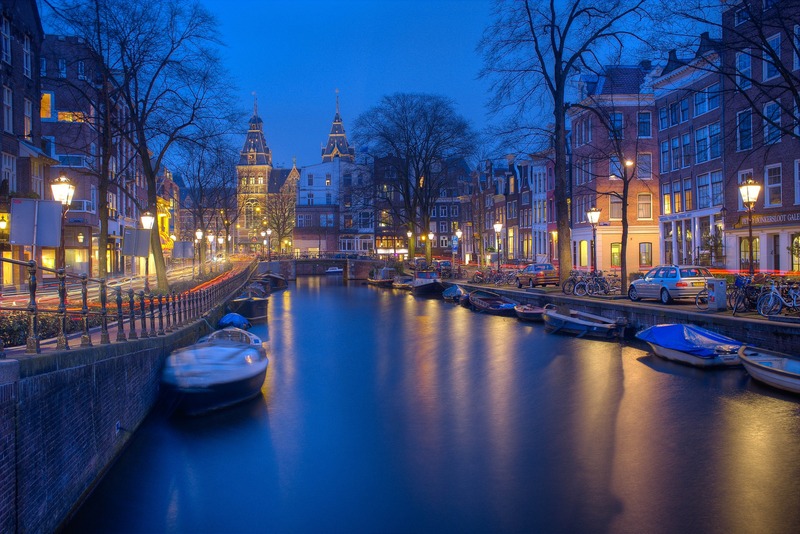 For more information about Leiden, click here. – Go ice-skating on the floating ice rink on the canals of Leiden. It’s an experience like no other. It’s opened from the 8th of December until the 6th of January. – Visit the nostalgic funfair between the 14th of December and 6th of January. – Take a photo of your loved ones and put them into the big Christmas tree in Leiden. From the 7th of December. – Enjoy the choirs throughout the beautiful city of Leiden. This music festival during the Christmas market of Leiden is on the 15th and 16th of December 2018 and the 22nd and 23rd of December 2018. The choirs are spread throughout the city which adds to the surprise effect. – Go back to the year 1850 and enjoy the Pieterskwartier looking like ‘A Christmas Carol’ from Charles Dickens. While you’re admiring the beautifully decorated streets, enjoy the street theatre and get a bite on the Pieterskerkplein. This is only on the 15th and 16th of December. – Drink as much glühwein as possible, while staying safe of course. From Amsterdam: Take the sprinter train or intercity in the direction of Den Haag or Vlissingen from Amsterdam Centraal. Get out at Leiden Centraal. This will take you around 40 minutes. From Rotterdam: Take the intercity from Rotterdam Centraal in the direction of Amsterdam Centraal or to Lelystad Centrum. Get out at Leiden Centraal. This will take you around half an hour. From Utrecht: Take the train from Utrecht Centraal in the direction of Leiden Centraal. Get out at Leiden Centraal and walk your way to the market. This will take you around 50 minutes. The Christmas market of Leiden dates from Friday the 14th of December and closes at the 25th of December 2018. You can visit the floating market in Leiden for free. The opening times of the market are in general 12:00- 21:00, there are a few exceptions that are stated below. Ibis Leiden Centre, click here to see the availability. Boutique Hotel Rembrandt, click here to see the availability. Boutique Hotel Steenhof Suites, click here to see the availability. There are two Christmas markets that you should visit in Amsterdam. So, if you’re looking for the best things to do in Amsterdam in December, then visiting these Christmas markets should be included in your itinerary. The first Christmas market is the Funky Xmas Market Amsterdam. This market in Amsterdam is located at the venue of the Sunday Market. Every week the Sunday Market in Amsterdam is the place for designers, artists, and creatives to show their creations. And on Sunday the 16th of December this market in Amsterdam will turn into a Christmas market. The date of the 2018 Funky Xmas market in Amsterdam is the 16th of December 2018. Location: Westergasfabriek, Pazzanistraat 33, Amsterdam. From Rotterdam: There are around 6 trains an hour directly to Amsterdam Centraal from Rotterdam Centraal. It will take you around 40 minutes. Then walk or take one of the many busses in the direction of Westerpark. From Utrecht: There are around 6 trains an hour from and to Amsterdam Centraal from Utrecht Centraal. This will take you around 30 minutes. Then walk or take one of the many busses in the direction of Westerpark. The next Christmas market in Amsterdam that you should visit is the Sissy-boy Christmas market. This is a very creative and family-oriented festival, however definitely one you cannot miss out on. From Rotterdam: There are around 6 trains an hour directly to Amsterdam Centraal from Rotterdam Centraal. It will take you around 40 minutes. Then take metro 52 in the direction of Station Zuid from Amsterdam Centraal. Get out at Vijzelgracht. From there walk to Amstelveld. From Utrecht: There are around 6 trains an hour from and to Amsterdam Centraal from Utrecht Centraal. This will take you around 30 minutes. Then take metro 52 in the direction of Station Zuid from Amsterdam Centraal. Get out at Vijzelgracht. From there walk to Amstelveld. Generator Hostel Amsterdam, click here to see the availability. The Student Hotel Amsterdam City, click here to see the availability. The Student Hotel Amsterdam West, click here to see the availability. Hotel2stay, click here to see the availability. Jordaan Suite bed and bubbles, click here to see the availability. Deventer has one of the most unique and quirky Christmas markets of The Netherlands. You will be going back to the 19th-century English city of Charles Dickens. The Christmas market of Deventer is also named Dickens Festijn. More than 950 characters out of the books of the famous English writer will come alive. From Oliver Twist to Mr. Pickwick. This Deventer Christmas market is held on the 15th and 16th of December 2018. Besides the Charles Dickens fest, there is also a Christmas market in the Lebuinus church. Here you will find many stalls that offer anything you’re searching for. This market is from the 13th until the 15th of December. Yearly more than 120.000 people visit these two Christmas events in Deventer. That makes it one of the most popular Christmas markets of The Netherlands. – Visit the free concerts of choirs in the Lebuinus church and Broederen church on the 16th of December. You can visit them for free. – See the permanent exposition of Charles Dickens at the Dickens Kabinet. It is opened every Saturday from 11:00- 17:00. The entrance is 2 euros. – Enjoy the Christmas market in the Lebuinus church, while enjoying the musical performances that are held throughout the area. This market is from the 13th until the 15th of December. Admission fee is 3 euros. – Go shopping on the special Christmas shopping Sunday in Deventer on the 16th of December. – Visit de Brink market on Saturday the 15th of December. This is the weekly market of Deventer, but still, one you shouldn’t miss. On the 16th you will find a market in the Christmas spirit from 11:00 – 17:00. Also, one you shouldn’t miss out on. From Amsterdam: Take the intercity in the direction of Deventer from Amsterdam Centraal. Get off at Deventer. This will take you 1:15 hour. From Rotterdam: Take the train from Rotterdam Centraal in the direction of Leeuwarden. Transfer at train station Amersfoort to the intercity to Deventer. Get out at Deventer. This will take you around 1:30 hour. From Utrecht: Take the train from Utrecht Centraal in the direction of Deventer. Get out at Deventer. This will take you around 50 minutes. Dickens Festijn (fest): 15th & 16th of December 2018 from 11:00 – 17:00. Entrance: Keizerstraat, Deventer (centre of Deventer). Location: The Dickens Festijn is located in following streets and areas; de Walstraat, Golstraat, Damstraat, Bergkerkplein, Roggestraat, Bergschild, Kerksteeg, Menstraat and Bergstraat. Christmas market Deventer Lebuinus church: Thursday 13th of December- Saturday 15th of December 2018. Opening times Christmas market Deventer: 13th of December 14:00- 21:00, 14th 10:00 – 21:00, 15th 10:00 – 18:00. Admission fee: 3 euros. Kids 12 and under are free. Grand Boutique Hotel Huis Vermeer, click here to see the availability. Boutique B&B Huize De Worp, click here to see the availability. Hotel Hanzestadslogement De Leeuw, click here to see the availability. One of the most beautiful fortified cities of The Netherlands is the city of Bourtange. And the best part? In the fortified city of Bourtange, there is a Christmas market on the following dates: 1,2, 8, 9, 15th and 16th of December 2018. Bourtange is a beautiful city in the province of Groningen. So if you’re looking on things to do in the surroundings of Groningen, visiting Bourtange should be on your list. Experiencing a Christmas market in Bourtange will be like an experience you will never forget. The unique location and the beautiful decorated fortified city. There are Christmas trees on top of the ramparts and the bridges and roads are completely decorated with thousands of lights. This has to be one of the most unique and special Christmas markets in The Netherlands. The Christmas market of Bourtange is also one of the best Christmas markets of the Northern part of the Netherlands. There are almost 100 stalls that you can find throughout the fortified city. From Amsterdam, Rotterdam and Utrecht getting to Bourtange takes at least 3-4 hours one way. You have to make sure to get to the train station of Winschoten first. From there it’s only a 50-minute busride, with one transfer. For more information check 9292.nl. This website is what every Dutch person, including myself, uses to get to know the shortest and best route for destinations within The Netherlands. You can find the Christmas market as soon as you enter the fortified city of Bourtange. The Christmas market in Bourtange takes place on the 1,2, 8, 9, 15th and 16th of December 2018. Hotel Vesting Bourtange, click here to see the availability. De Hiddinghhoeve, click here to see the availability. Maastricht is a beautiful city in the province of Limburg, so visiting Maastricht in The Netherlands is always a good idea. However, during December Maastricht has something more to offer than being a beautiful medieval city. The Christmas market of Maastricht is held in the most famous square of the city, Vrijthof. From the 1st of December until the 31st this square turns Maastricht into a Christmas spirit. Visiting the Christmas market of Maastricht is one of the best things you can do in December. 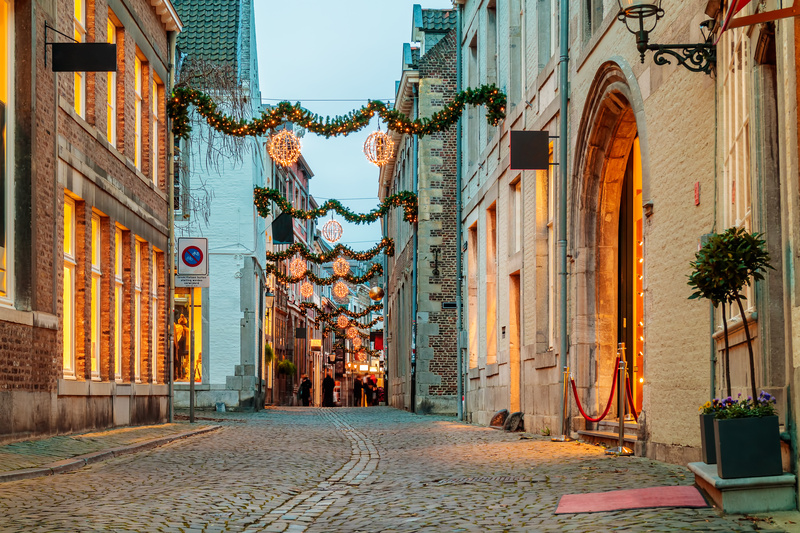 You can explore the city of Maastricht, while also visit one of the best Christmas markets in The Netherlands. – Get the best view of Maastricht in the 60 meters high Ferris wheel. – Go ice-skating and buy yourself a hot chocolate afterwards. – Discover the indoor part of the Maastricht Christmas market. Even when it’s pouring outside, you can enjoy the market. – Eat all the food you possibly can. There are a lot of places to get food so you can eat your heart out. – Visit the house of Santa, from the 8th of December 2018. – Walk the magical ‘lichtroute’ until the 7th of January 2019. You will see the most beautiful parts of Maastricht beautifully lit up by Christmas lights and decorations. Click here for the route. From Amsterdam: Take the intercity train from Amsterdam Centraal in the direction of Maastricht. Get out at Maastricht. This will take you around 2,5 hour. From Rotterdam: Take the intercity from Rotterdam Centraal in the direction of Eindhoven. Get out at Eindhoven and transfer to the intercity in the direction of Maastricht. Get out at Maastricht. This will take you around 2:15 hour. From Utrecht: Take the intercity from Utrecht Centraal in the direction of Maastricht. Get out at Maastricht. This will take you around 2 hours. Dates Christmas market Maastricht: 1st of December until the 31st of December 2018. At the 7th of December, the arrival of Santa is planned. The Dutch Maastricht, click here to see the availability. Bouteaque Hotel, click here to see the availability. Stayokay Maastricht, click here to see the availability. 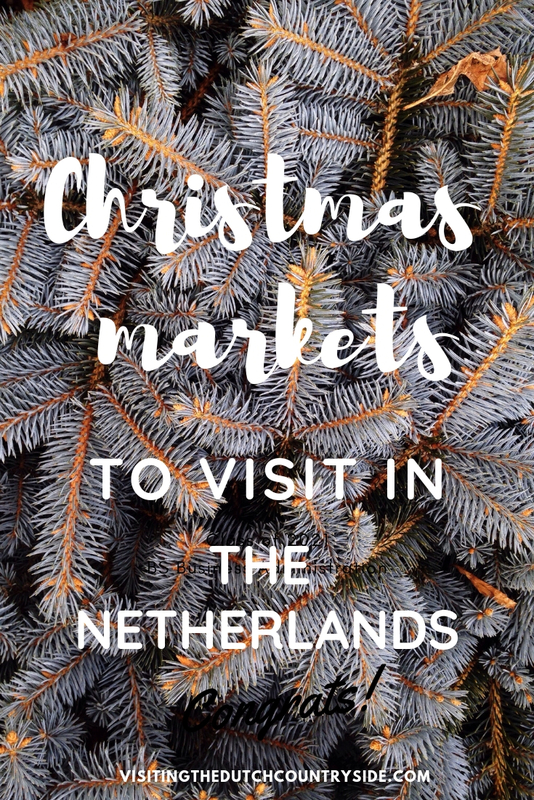 Do you want to visit a special Christmas market in The Netherlands? You’re in luck because there is a Castle Christmas Fair in Slot Assumburg. 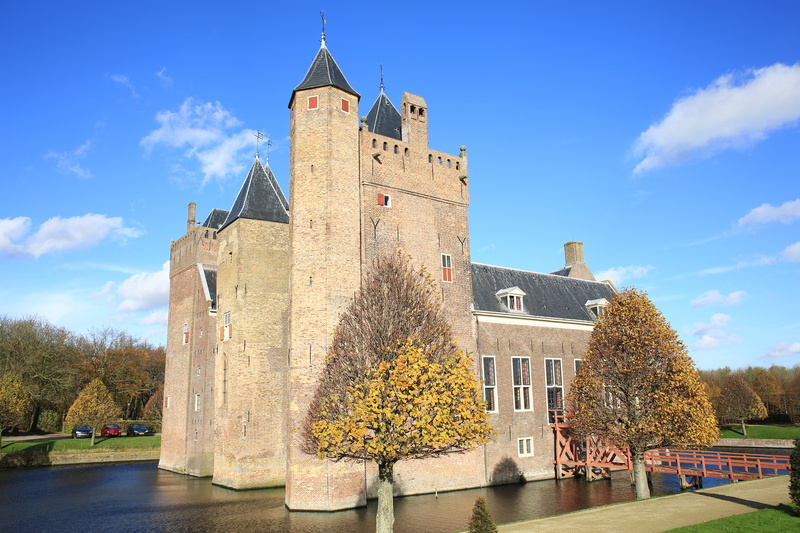 Slot Assumburg is a castle in the city of Heemskerk in Noord-Holland. This Christmas market in Heemskerk is held in the gardens of Slot Assumburg. The location alone makes this Christmas market in Noord- Holland very special. You can find more than 150 stalls in the garden of castle Assumburg. You will find performances by local bands and choirs. Find drinks, bites and much more. – Walk past the more than 150 stalls to enjoy the Christmas and lifestyle products that are spread throughout the castle garden. From Amsterdam: Take the sprinter in the direction of Uitgeest from Amsterdam Centraal. Get out at Uitgeest. Transfer to bus 71 or 73 and get out at De Baandert. From there it’s a ten-minute walk to the castle. This will take you around 50 minutes. From Rotterdam: Take the train in the direction of Amsterdam Centraal from Rotterdam Centraal. Get out at Haarlem. Take bus 73 in the direction of Uitgeest and get out at De Baandert. From there it’s a ten-minute walk to the castle. This will take you around 2:20 hours. From Utrecht: Take the sprinter in the direction of Uitgeest from Utrecht Centraal. Get out at Uitgeest. Transfer to bus 71 or 73 and get out at De Baandert. From there it’s a ten-minute walk to the castle. This will take you around 1:45 hours. Admission fee: 8,75. Kids until 6 are free to go. StayOkay Heemskerk, where you have the chance to stay in the castle of the Christmas market. Click here to see the availability. Haarlem is another beautiful city in The Netherlands that has a Christmas market. If you’re looking for things to do in December in Haarlem, then visiting this Christmas market is a great idea. If you’re free in the weekend of the 8th and 9th of December 2018, you have to visit the Haarlem Christmas market. The Christmas market of Haarlem is one of the biggest Christmas markets of The Netherlands. Besides typical Dutch treats, you can also find hundreds of stalls and plenty of performances. What makes this Christmas market special is that at the same time you can find a beer festival as well. So if you’re sick of the glühwein, you can visit the winter beer festival in Haarlem instead. From Amsterdam: Take any of the 7 trains an hour that go from Amsterdam Centraal and pass Haarlem station. From Haarlem train station it’s only a five-minute walk to the Christmas market. This will take you around 20 minutes. From Rotterdam: Take the intercity from Rotterdam Centraal in the direction of Amsterdam Centraal. Get out at Haarlem station. It’s only a five-minute walk from Haarlem train station to the Christmas market. This will take you around one hour. From Utrecht: Take any train that will pass Amsterdam Centraal station. From there take any of the 7 trains an hour that go from Amsterdam Centraal and pass Haarlem station. From Haarlem train station it’s only a five-minute walk to the Christmas market. This will take you around one hour. Date: The Christmas market in Haarlem takes place on the 8th and 9th of December 2018. Beer festival: Free. Unless you want to enter the festival 1,5 hour before everyone else, so you can try the 35 beers without standing in a line. This will cost you 17,50 euros. See the tickets here. Kruisstraat, Krocht, Nieuwe Groenmarkt, Zijlstraat, Grote Markt (only on Sunday), Koningsstraat, Botermarkt (only on Sunday) Gierstraat, Grote Houtstraat from Proveniersplein to Houtbrug, Schagchelstraat (only on Saturday). Haarlem Winter beer festival takes place at the Broereplein. B&B Het Hart van Haarlem, click here to see the availability. Stayokay Haarlem, click here to see the availability. Studio Haarlem, click here to see the availability. I hope this article was useful for you and that you’ll enjoy the best Christmas markets in The Netherlands. Have you been to a Christmas market in The Netherlands already or are you planning on visiting one? Is there any information you’re missing? Share this post!